How to setup a trigger that reads and writes the card serial number from a card to your project. 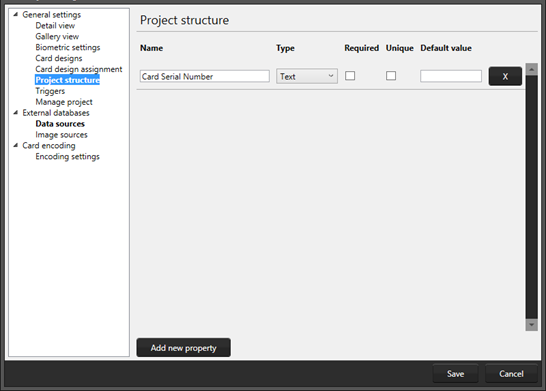 Open an existing project with card designs and data. Add an extra column to your project. BadgeMaker Identity can read the serial number of the printed card and write to the record in that column. Go to “Edit” in the main menu and go to “Project Settings” and click on “Project Structure”. Click on “Add new property” and name this text data column: Card Serial Number. Go to “Edit” in the main menu and go to “Project Settings” and click on “Triggers”. Now add a trigger on the event “after printing”. Click on the event “After printing”. Now select the data field from the drop-down and add a trigger on “Card Serial Number” and click on “Add Trigger”. BadgeMaker Identity can read the serial number from the smart card and write to your project after printing. 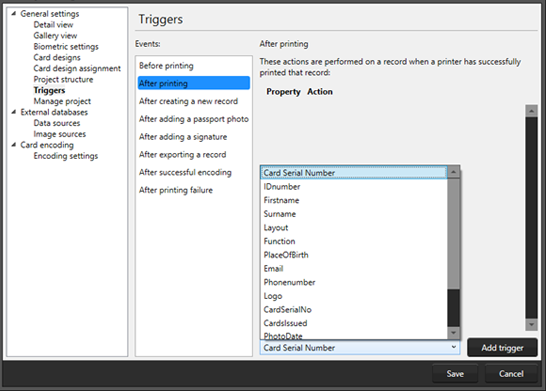 After adding the trigger for the serial number column, select the action “Set card serial number” from the drop-down menu. Also check the first box on how to write the serial number to significant byte first, same as the encoding file. Do not forget to save this trigger setup. You have now setup the trigger and BadgeMaker Identity will add the serial number to the column for the record that has been printed.